Virtual reality comes of age - these are great libraries containing a fantastic range of sounds. Mostly convincing sounds. Won't tax your CPU. WIVI Player is a revelation. Flutes lack slightly lack realism. The world is awash with orchestral string collections, with all formed of mammoth sampled libraries. Other orchestral sections aren't represented in the marketplace to the same extent, but Swedish company Wallander Instruments is addressing this balance with its WIVI Instrument libraries. Rather than samples, WIVI uses synthesized modelling techniques to produce its sounds, with a correspondingly low demand on your computer's CPU and almost immediate instrument load times. The WIVI interface is Wallander's secret weapon, as staggering amounts of variation can be controlled. To get started, simply click the '+' button in the bottom right-hand corner of the main pane and up pops a list of all of the instruments. Click to add one or drag upwards to add multiple instances of the instruments you want; these are added to the virtual stage of your choice. 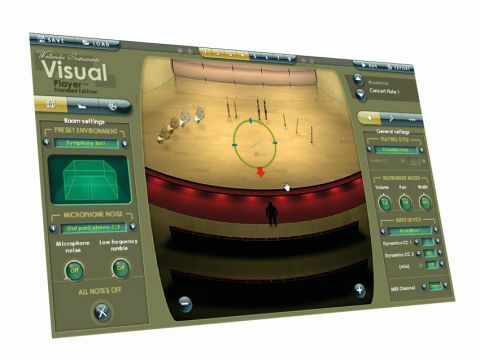 There are several acoustic spaces available, with a 'man' icon at the bottom indicating your virtual listening position. Tone and reverb are shaped in real time, so you can position yourself and shift instruments around until you've created your perfect 'virtual' setup. You can even direct instruments individually, replicating a shifting microphone placement by turning the instrument through 360 degrees until you find the sound you want, while reverb is also fully tweakable. Beyond that, you can decide whether all instruments will play back on the same MIDI channel or be spread across many, choose muted or unmuted variations, and assign controllers for vibrato and articulation - the results of which can be stunning. Most of the excellent range of instruments sound great, with wonderful richness in the low orchestral brass a major highlight, as are the solo saxophones that, particularly when used with MIDI controllers, truly come alive. The weakness for us is in the flute sounds, which somehow lack the required air and breath - though they do integrate well into ensemble groups. Straight out of the box, this is an impressive instrument but it gets better still. WIVI supports scripting codes that can carry out a multitude of musically useful tasks, such as creating sequences or shifting tuning scales. By default, the Standard Edition Player is included, but the Professional Player can also be purchased to 'unlock' additional playing techniques that will appeal to pros looking to make these collections their go-to brass and wind libraries. The collections aren't cheap but, pro or otherwise, they deserve your attention.